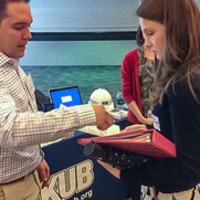 The Office of Engineering Professional Practice's Engineering Expo is the premier event for recruiting engineering co-op and internship students here on the university campus. With their students, they focus on the educational aspects of the co-op and internship process and encourage them to seek positions that match their academic and career goals. All engineering students are welcome and appreciate your feedback. Thank you for your support of this event – one of the few engineering-only co-op and internship events in the country!